McKamey Animal Center accepts stray domestic pets (not wildlife) found in the city of Chattanooga. Stray pets found in Hamilton county outside Chattanooga city limits must go to the Humane Educational Society. Stray pets found outside of Hamilton county must go to the animal control agency responsible for that area. If you are unsure who is the agency responsible for your area, try calling your local sheriff's department or do an internet search for "________ County Animal Control"
McKamey Animal Center takes in more than 6,000 animals each year from our community. We firmly believe that adoptable animals should never have a time limit, and our staff and volunteers do everything we can to provide the best medical and behavioral support while our furry residents await their new homes. We are dedicated to helping you keep your pet and can offer you resources to help, such as free pet food, veterinary assistance, behavior advice and much more. Do not hesitate to let us know how we can help you and your pet stay together! 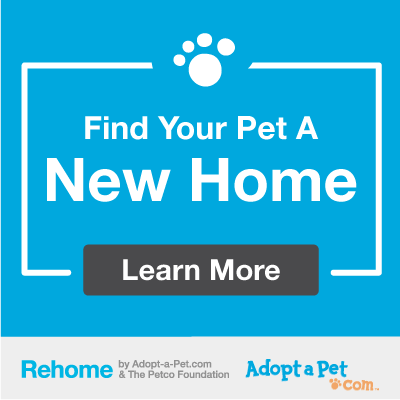 If you need help finding a new home for your pet, Adopt-a-Pet and the Petco Foundation offer an easy to use re-homing service. Just click the banner below! The Admissions Department books by appointment only. If surrendering your pet remains your only option, you may schedule a surrender appointment by contacting our Admissions Department. Appointments are made Tuesday through Sunday, except for holidays when the shelter is closed. If no appointment is made, there is an inconvenience fee of $35 on top of regular fees. Please compile any medical records for your pet(s) and bring them to your appointment. This will prevent your pet from receiving unnecessary medical procedures. Detailed and honest information is crucial to our placement process. Undesirable behaviors and medical issues do not necessarily prevent placement; however, not disclosing them may. For Chattanooga city residents, McKamey has a surrender fee of $40 for each animal. For litters, the fee is $40 for the mother or first puppy/kitten and $5 for each additional puppy/kitten. For residents outside of the city, McKamey has a surrender fee of $100 for each animal. For litters from residents outside of the city, the fee is is $100 for the mother or first puppy/kitten and $10 for each additional puppy/kitten. These fees help us with the cost of caring for your pet, which is over $500 per animal. If your dog is purebred or has a medical condition, a rescue group may be able to help you place your dog. The following listing includes some of the rescue groups that partner with McKamey. Many of these organizations do not have a physical shelter or boarding facility so it may take time before they can help you. This list is for your information only, McKamey cannot make any guarantees that your pet will be accepted into a rescue.